God is lamenting Israel's foolishness and the damage done to the earth. *TiS 668 / AoVK-34 / ATFG587 / NCH569 / CH243 / VU307 / R254 / ELW739 / AA143 / A&M553 / GtG713 / G(3)805 / W&R38 / Cha693 / URW189 / StF729 Touch the earth lightly (Murray) Sings of the redemption of creation and our complicity in its destruction. Sources vary in their set tunes. TiS has a good tune (TENDERNESS) with a nice minor key change to the relative minor for the second verse. Can also be sung to BUNESSAN, if you need a familiar tune. Youtube video with all lyrics. New words to old tunes (if you want). CH240 / W&R37 / StF727 / Lau687 / MP832 God in such love for us lent us this planet (Pratt Green) Really excellent lyrics of caring for creation and a reminder that the Earth is God's. Not all versions are inclusive (CH is). Lyrics (scroll down, and enjoy the other harvest songs listed as you do). *AHB 106 / CH238 / A&M543 / CP(E) 257 Lord bring the day to pass (Fraser) Excellent words. Care for the earth. New heavens and earth. 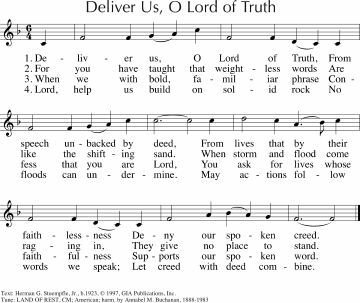 Can be sung to one of my favourite hymn tunes (LOVE UNKNOWN), but other tunes are also listed. Lyrics and a tune sample. New words to old tunes. MV135 Called by earth and sky (Mayberry) Gentle song about being called to care for the earth. Sheet music. *VU305 Into the unshaped silence (Tufts) Lovely words of a new day, a day of rest, and care for the earth. You could choose just one verse and sing it as a round. NCH559 / PH266 / W&R36 Thank You God for Water Soil and Air (Wren) Good words asking God to help us renew the face of the earth by caring for creation. A prayer of confession. *TiS 651 Take, take off your shoes A fun slightly silly song for kids; this song is focussed on caring for the earth and creation. Good for kids. Doesn't anyone around here believe in what is true? Emergent Psalter Fools say in their heart "There is no God" (Everett) An excellent, modern refrain which is very singable, and can be sung with a second refrain over the top from Psalm 53. Sheet music (refrain only). *TiS 469 This is the truth we hold (Bridge) This is a new one for me. It has very positive words about Christ as our truth through the ages. The tune is also new, but is not difficult, especially if you play it through once before starting to sing this. "This is the truth we hold, source of the joy we share, hope that can make us bold, trusting the name we bear: that "Christ has died" and "Christ is risen, in Christ shall all be made alive". *MV31 / Linnea Good Pure love A simple two-part chant that picks up the Psalmist’s idea of the purity of God’s law “Pure love, pure truth, pure justice, God”. Would be great if you can teach it to some of the congregation before worship starts. Good for kids. The Golden Calf. Who brought the Israelites out of Egypt? A cow? Moses? God? *Iona (SBL) / MV068 / G(II)405 / GC581 / GtG578 / PfAS009A Kyrie Guarany / On the poor, on the poor (Sosa) A simple Kyrie from Paraguay; This is our current favourite at Brunswick. The English translation varies depending on the source (we don't sing On the Poor). Sound sample (track 12). Good for kids. *Tune In / NCYC '07 Forgive us now (Brown) An excellent ballad. Lyrics and sound sample. "Forgive us now, O mother love for all the idols we have built, For all the time we’ve worshiped there in company of dark despair. Forgive us mother of all hope”. *Online Resource Open my heart (Hernandez) A beautiful 3 part chant, which also works as a single part chant. Sheet music. Youtube of the song being taught and sung in 3 parts. *TiS 712 / AoV2-021 / ATE 269 / The tide has turned songbook Create in me a clean heart O God (Hannah) A big favourite in our congregation, and a big favourite of mine. *MV015 / GA186 Holy Sacred Spirit (Brown) Gentle chant, which would work well at the start of the service. Can be used without the cantor part. "Holy Sacred Spirit, breathe your breath on us". Youtube (VERY SLOW) Good to help kids settle. *AoV1-158 / GA438 Create a new heart Holy Lord / A new heart for a new world (O'Brien/Watts) Very simple melody, excellent words "Create a new heart Holy Lord, beckon our lives through your word, open our eyes to your call, United as one for your world". Lyrics and slightly odd sound sample. GA040 Create in Me a Clean Heart O God (O'Brien) Nice refrain and simple cantor part for this Psalm. GtG423 / W&R378 / PfAS051H Create in Me a Clean Heart O God (Carter) A very simple, and repetitive version of the Psalm. Lyrics and sheet music sample. Cha743 Create in me a clean heart O God (Mueller) Very simple refrain and responsive reading. GtG431 / SFFS 2134 Forgive Us Lord / Perdon Senor (Lockward / Martinez) Call and response prayer of confession. NCH784 Create in Me a clean heart (Diemer) Easy to sing. Nice words. *Online Resource Create in Me a pure Heart O God (Harding) A nice round, with an optional descant part. Good for kids. Sample sheet music Purchase here (note that the sound sample is for a different song). ATOK 399 Holding out your hand (Holmes) I like this one. Good for kids. *?GC(II)409 / G(3)477 Lord Jesus Christ son of the living God (Browning) A simple chant based on "The Jesus Prayer" with a beautiful (and optional) cantor which is really worth using. Nice chords! Nice sound sample and sheet music sample Sound sample Lead sheet. Psalm Project - Sharing the Road Wash Me Clean (Bruxvoort-Colligan) A nice, gentle reworking of the Psalm. Might be good to ask a musician to sing this one. Available here. *TiS 729 / Iona (HSNW) Jesus Christ, Son of God have mercy upon us A very very simple call and response chant. *? TiS 744 Refresh my heart Lord (Bullock) I'm surprised at myself for suggesting this song, but I think it could work very well, especially if played in a laid back sort of way. Lyrics and chords. *Iona (Sent By the Lord) / MV066 Senzenina? / What have we done? (South African) This beautiful chant from South Africa asks the question that we often ask when things go wrong beyond belief. It's important to know what the song means when singing it. If you have some part-singers in your congregation, this would be particular good. It's good to let people ask this question. It is also on the soundtrack for "The Power of One" so you could also play the recorded music if appropriate. Free sheet music (loads a pdf). Maybe this could work as a Psalm response? Linnea Good Ah then these shattered broken bones (Good) Simple song; best if you have enough singers to cover all the parts. PfAS051I Lord Have Mercy (Brumm) A simple call and response Kyrie. Good for kids if you sing it with some energy. ATOK 354 / ELW801 / SFFS 2152 / GtG695 / SP&P128 / W&R373 / PfAS051A / ZSS178 / Srce95 Change my heart O God / Cambiame Senor (Espinosa) A mushy old favourite. SFFS 2134 Forgive Us Lord / Perdon Senor (Lockward) Call and response prayer of confession. Online Resource Create in Me (Keesecker) A lovely choral piece. Listen to the full sound sample, it just gets better and better. Sound sample, PDF sample, and purchasing options. Grateful to be chosen; Some Glorias would be good. TiS 143 / AHB 80 / NCH1 / CH132 / UMH103 / VU264 / A&M676 / LBW526 / ELW834 / HPP37 / GtG012 / PH263 / GC507 / CP(E) 474 / W&R48 / Cha066 / ZSS4 / Srce296 / 82Hml-423 / Lau725 / StF055 / MP327 Immortal invisible God only wise (ST DENIO). An oldy-but-a-goody. "In light inaccessible hid from our eyes". Lyrics, tune sample. Words are mostly inclusive for God's gender, but for the last verse which our congregation usually sings as "Great Father of glory, pure Mother of light", except for the last time we sang it. Oldy-but-a-goody. Iona (TI1AU) / MV038 Glory to God / Nzamuranza (Mozambique / Matsikenyiri) Simple African call and response song. Sound sample. *TiS 775 / ATOK 317 / Iona (M&G) / VU895 / GtG584 Glory glory glory glory be to God on high (Sosa) A simple Gloria. CoC20 Gloria (Bray) A pretty majestic gloria in 4 part harmony. CoC21 Gloria (Gibson) This Latin gloria could be sung as a simple chant, a 3-part canon or a four part chorale! GC(II)190 Glory to God in the highest (Beneath the Tree of Life) (Haugen) Communion response A good joyful Gloria. Just needs a word substituion for "his people" to "God's people". The sound sample actually does that and it still works well. MV124 Glory to God in the Highest (Trinidad) A good simple Gloria from the Caribbean Conference of Churches. TiS 129 / AHB 56 / AoV1-029 / ATA 131 / NCH547 / CH555 / UMH378 / VU266 / LBW448 / ELW779 / A&M587 / GA437 / HPP334 / GtG649 / PH280 / G(II)434 / GC612 / GC(II)586 / G(3)645 / CP352 / CP(E) 375 / W&R422 / Cha546 / ZSS202 / Srce25 / Lau846 / StF440 / MP031 Amazing grace how sweet the sound (Newton) I once was lost... I think you all know this one. Nice youtube of some Sacred Harp singing, and a story. I love the recording of Dr G Yunipingu singing this in Yolngu; so sad that he is no longer singing on this earth. Oldy-but-a-goody. The lost sheep and the lost coin are found; cause for celebration! TiS 179 / NCH273 / VU312 / GA379 / StJ / URW073 Praise with Joy the World's Creator One of my favourite hymns - strongly Trinitarian lyrics and excellent imagery. I particularly love the “One God in community” phrase. Some versions change "Son" to "Christ" to make it more inclusive. Lyrics (scroll down). ATAR598 / Tune In / NCYC 2009: God has laid a feasting table / Invitation (Whelan). Feminine imagery of God gathering her guests to a feasting table. Fun Cuban rhythm. Particularly good if you are celebrating communion, but you don't need to be for it to make sense. Sound sample, sheet music and songbook. *MV020 God of still waiting (Daw) Good words about God waiting for us and the promise brought by the Spirit. Tune is quite beautiful, and will need to be taught at least a little. Lyrics. TiS 233 / AHB 173 / A&M671 / SP283 / Srce2-319 / StF323 / MP315 I will sing the wondrous story A good old fashioned sing (HYFRYDOL). Note that it uses masculine language for Christ, which may bother some. “I was lost but Jesus found me, found the sheep that went astray, raised me up and gently led me back into the narrow way”. Verse 2 is particularly appropriate. I actually quite like the "companion Christ" imagery. Lyrics and tune sample. Oldy-but-a-goody. ATN 77 / G(II)542 / GC749 O Welcome All You Noble Saints of Old / In Christ There Is a Table Set for All We often sing "We and God at Table are sat down" instead of the original "God and man at table are sat down" from ATN 77, however, the Gather hymnals use "In Christ there is a table set for all" which I also really like! Good for celebration of communion Older style lyrics. Good for kids. Online Resource God's great love is so amazing (Winfrey-Gillette) Good words about this story, to the familiar tune CONVERSE (What a friend we have in Jesus). Lyrics. Please add your suggestions in a comment below. I'd love to hear of any appropriate songs you may know.